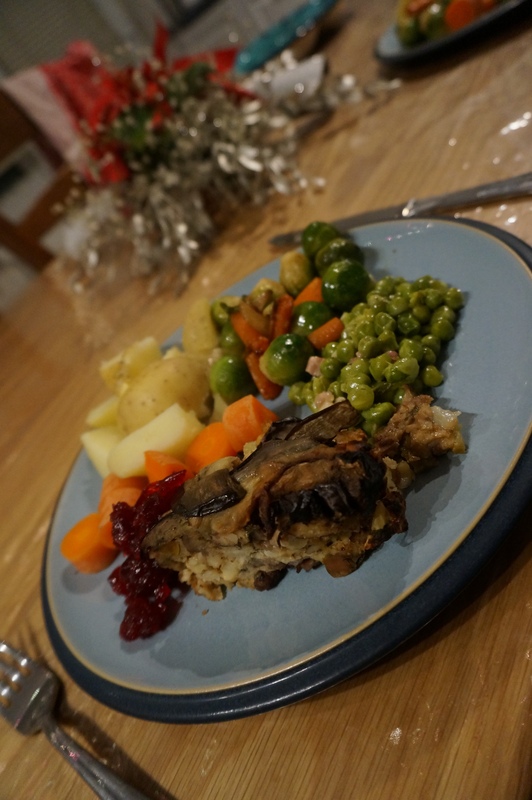 It’s Christmas, so you need brussel sprouts. But brussel sprouts are quite dull. Thankfully, there are ways to make them a bit more interesting. I had intended to add chopped-up chestnuts, but when I went to use them they had grown a nice layer of mold. I figured it was better to throw them away and just add the flavouring to the sprouts. It’s a really easy recipe – basically you just boil the sprouts for a few minutes, then fry them in butter, salt and pepper and nutmeg. It worked well, and the lack of chestnuts really just meant that, well, there were no chestnuts! These aren’t complicated, and I’ve made them before. They’re so simple, in fact, that I don’t even need a recipe to make them. Just some chipolatas (in this case, some mini ones and some longer ones), some streaky bacon and a bit of time to wrap the bacon around the sausages. I made these back in November and froze them ready for Christmas Day. This makes basically no difference to how they taste, and on Christmas Day they were still a favourite. The last few tasted good on our Boxing Day Christmas pizzas too! The second of the two cupcakes I made from my Hummingbird Bakery cookbook this week (the first being the candy cane cupcakes), these eggnog cupcakes actually turned out to be quite tasty. 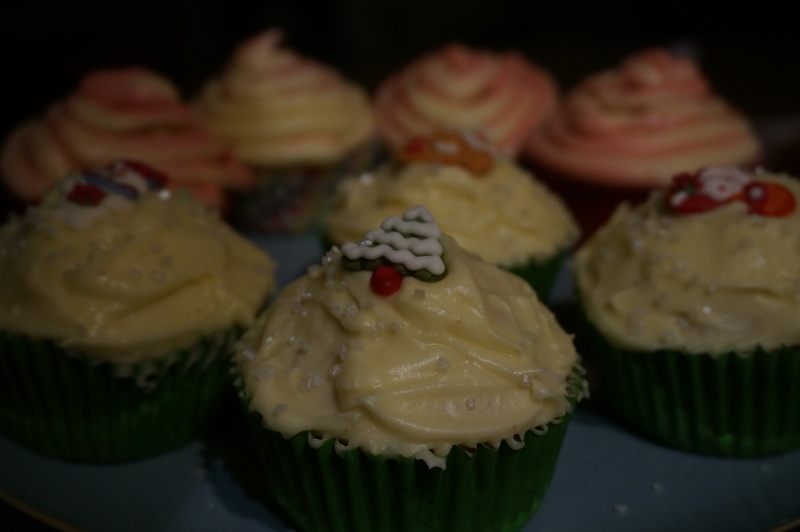 I wasn’t too sure when I first tasted the frosting (it really did taste like quite strong eggnog), but combined with the relatively plain fairy cakes I thought it actually worked really well. The frosting for these cupcakes is simpler than for the candycane cupcakes – it’s basically just designed to look like snow, so is easy to apply to the cake just using a knife. It is simply a combination of butter, icing sugar, milk, grated nutmeg and rum essence (never used that before!). You finish the cakes off by adding Christmas-themed sugar shapes; in my case a Santa, a tree, a gingerbread house and a snowman, just because that was what was in the packet! These cakes, unlike the others, are actually Christmassy enough (and taste different enough) so that I probably would be willing to give them away as Christmas presents – as long as they were going to be eaten in the next couple of days! 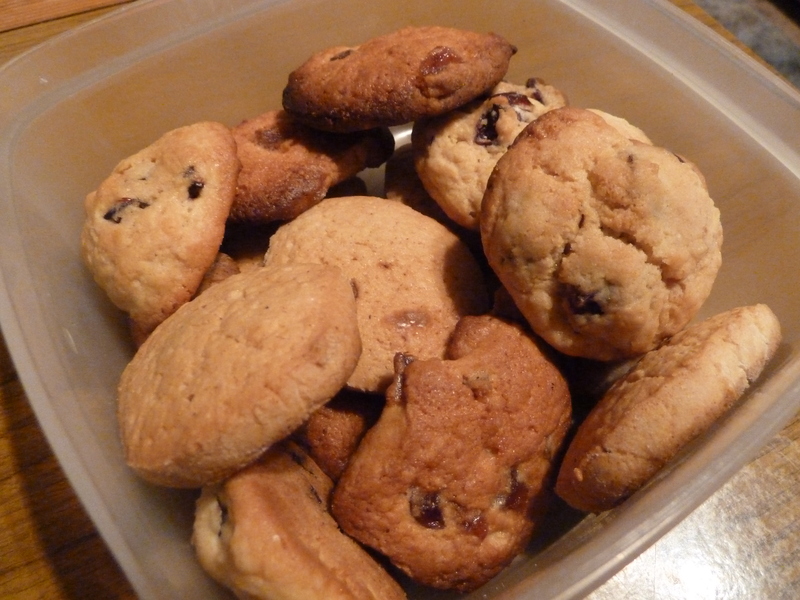 As the recipe for these biscuits makes such a vast amount (60-72), I decided to halve the ingredients. That made about 30 biscuits, which was still enough to feed my parents, my husband, my friend, and my colleague and her husband who have just had a baby (which was who the biscuits were really intended for). As the recipe suggests, I made three different flavoured biscuits. Cranberry flavour, cinnamon and nutmeg flavour and cherry flavour. My least favourite were the cherry biscuits, but that’s entirely my fault for leaving them in the oven a little too long, and them being rather more crispy than was intended. The recipe for these mini biscuits calls for the mixture to be rolled out and then put in the freezer for a least a few hours before you cut out rounds. The problem with this is that the mixture is then really hard to cut when you remove it from the freezer, because it’s so hard. I also had a few problems mixing up the pastry in the first place – it was way too wet initially (admittedly, partially my fault for adding too much egg). So I had to add a ton of flour to turn it into a pliable consistency. Unfortunately, in the case of the cranberry biscuits it clearly wasn’t enough flour. When I tried to slice up the frozen mixture, it just fell apart. I was going to abandon the cranberry mixture entirely, but then decided I could easily roll it into balls. This worked well, and it turned out that when I put them in the oven, they spread out and turned into perfect mini biscuits – better shaped than either the cherry or the cinnamon/ nutmeg ones. A good tip for the future, and probably the way I will form all these biscuits if I make them again!